.......on Tuesday 21st August to the Vale Farm Stadium of Wembley FC. Superb late strikes from Mark Maher and Ronardson Obinna secured this FA Cup Extra Preliminary Round Replay after Borough had gone in 2 down at the interval. Borough started the new season in the Spartan South Midlands First Division in fine style. A blistering start saw them take the lead within the first two minutes of the opening game of the season against visiting Arlesey Athletic. The first goal came from Melvin THOMPSON after some good build-up play around the box. The second goal was soon to follow this time by Jamaal DUNCAN in the 9th minute after beating two opponents. The score was made 3-0 on the half-hour by a diving header from Omar Yaseen OMAR from Thompsons wide free-kick. Arlesey Athletic hit back in the second half with a fine long shot by Lee SHADBROOK to make the score 3-1. Haringey stepped up a gear and it was only a matter of time before they scored again which they did when Jamaal DUNCAN netted his second of the game scoring from a narrow angle to drive the ball past the goalkeeper. Haringey were then reduced to 10 men when Wayne Grant was sent off for a second bookable offence on the hour mark which limited Borough's opportunities to further increase the score-line. An all round good opening day performance for a Borough team showing lots of promise. A looping header from defender Andy Stokes midway through the second half was the only goal of the game with London Colney as Borough secured the one-off trophy to celebrate 100 years of existence. Full Match report on Fixtures & Results page. Prior to the match the Borough's Under 17s had turned in a fine performance to beat visiting Millwall Albion 3-0 in their Friendly. 2007 sees Haringey Borough celebrating its 100th birthday. The Club now playing at Coles Park is - following a history of breakaways, name changes, re-unifications and mergers - effectively the Club which began life in 1907 as TUFNELL PARK FC in the London League. Other names from its past history are Wood Green Town, Tufnell Park (Edmonton) , Edmonton, Edmonton and Haringey with the name HARINGEY BOROUGH finally being adopted in the mid 1970's. This coming Saturday, August 4th (3.30pm), Borough will be playing a pre-season match at Coles Park against LONDON COLNEY - another Club celebrating its centenary this year. At stake will be THE CENTENARY CUP. SPARTAN SOUTH MIDLANDS LEAGUE CHAIRMAN PAT BURNS and TREASURER TONY FORRESTER will attend as League Representatives and present Borough with its commemorative Centenary award. A big turnout is hoped for and we would like to see a lot of names from our past and in particular former Haringey Borough players and those who played for its earlier component teams. Before the main event at 3.30pm there will be the chance to see Borough's stars of the future when this seasons Under 17/18 team - mostly consisting of last seasons unbeaten in the Harrow Youth League Under 16 team when they take the field for an earlier match at 12.30pm against the Under 17s of Millwall Albion. While Borough have never really hit the heights - although they were beaten FA Amateur Cup Finalists in 1921 - it is to the credit of the many dedicated people who have kept the Club going through some very difficult times that it is still very much alive and planning for a better future with no less than 9 teams being fielded next season. Other illustrious names from the Non-League scene have risen to the top and then crashed out of existence, Walthamstow Avenue and Colne Dynamos immediately spring to mind, while unfashionable Clubs such as Borough, run by people who really love the game, struggle on determinedly and overcome all setbacks. HISTORY REPEATS ITSELF IN LONDON SENIOR CUP !! Unlucky Borough have been drawn away to the same Club that eliminated them from last seasons competition in the first round of the London Senior Cup - ROMFORD of the Essex Senior League. Last years game was a real thriller with Borough fighting back from two first half goals to lose 2-1 and rather unluckily failing to force at least extra time. London teams top of "Your Game "
"Your Game" is a partnership between the BBC and the Football Foundation, with support from Barclays Spaces for Sports. In the women's final, HFC from East London triumphed 3-1 over Wirral Ladies thanks to two sensational strikes from player-of-the-match Sarah Jane 'Minnie' Cleary. Despite the typically Mancunian weather, 40 teams who qualified from regional finals around England failed to let the rain dampen their spirits in a hotly-contested tournament. The Match of the Day cameras made the occasion the biggest of its kind with commentary, post-match interviews and analysis from pundits all beamed onto the big screens around the venue. The women's final was a tight affair but the difference was provided by Cleary who gave a defending masterclass of which former German captain Franz Beckenbauer would have been proud. Having carved out the early chances, Wirral Ladies were unlucky to find themselves 1-0 down after a low shot from HFC found the corner. The Merseyside team's resolute defence, which conceded just one goal in reaching the final, was relieved when the team equalised with a strike the HFC keeper failed to hold. But with time running out and the game deadlocked, Cleary began to forage from the back like a sweeper of old and struck home with what looked like a deflected shot. If that was fortunate, her next strike had her team-mates in raptures as she again produced a strong challenge in her own half, only to see the ball ricochet into the net. Wirral Ladies were heartbroken as the final whistle blew. But among the extreme effort, it was ironic that the nature of Cleary's two strikes belied her coolness under pressure. Indeed, she was more nervous when she watched the team's performance on the big screen afterwards. "It's good to be the champions and we'll be back next year with a bit more confidence," she said. "When you're playing you don't notice the cameras but when they are asking you questions you get a bit shaky. The whole Match of the Day set-up made us feel special." BOROUGH WOMEN entered two sides into what is probably the biggest and best 5 a side Tournament in the London area on 17th June and are delighted that one of our teams reached the semi-final stage before goind down by 1-0 to Bristol Academy - a national League side. However, expectations have been raised to such an extent by previous success (see below) that this not inconsiderable achievement almost feels like failure !! BOROUGH WOMEN ON THE RAMPAGE !! London "leg" of the Tournament at the Leyton Orient Community Centre. They will now go on to appear in the National Finals in Manchester on July 15th. Individual Player Award and the trophy for the "hardest shot" with a 58mph rocket. Below is an edited extract from the BBCs website. 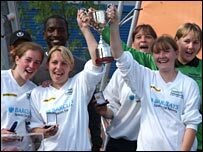 A hat-trick from striker Carrie-Anne helped HFC to a commanding 6-0 victory over Bethwin A to claim the women's trophy at Your Game East London. HFC, representing a Kick it Out initative in Hackney, produced a string of scintillating performances at the Leyton Orient Community Complex to stake their claim as potential champions at the national finals next month. HFC had only conceded one goal on their way to the final, which they dominated from the first whistle. Star player Sarah added two goals, one a superb finish from a mazy dribble while Jade added the other goal courtesy of a powerful long range strike. BOROUGH WOMEN got off to a flying start in their Small Sided Summer Tournament programme being beaten Finalists in the Tottenham Hotspur Ladies 5 a sides. It was the host team who finally overcame Borough in the final by 2-0. Not only that, but our player, SARAH CLEARY, won the "Player of the Tournament" accolade. Well done Sarah. We are delighted to have received the e-mail re-produced below from the Organiser of the event and certainly look forward to next years Tournament. "Thank you all for entering our first ever Spurs Ladies tournament. We hope you all enjoyed the day, and topped up your suntans because the weather was a little too hot to play football in but the effort all your players put in during the event was superb and we would like to thank each and every one of them to make our first tournament a success. The spirit the game was played in was how football should be played and at Spurs Ladies we try to install sportsmanship into our teams from an early age and the way your players performed and handled themselves on and off the pitch was of a very high standard of professionalism, and we thank you for that. We will be looking at next year for another five a side event and hopefully you would all like to come again and play in our tournament. Meanwhile a few miles down the road the Club's Under 13 Boys were also acquitting themselves well in the Omonia FC 6 a side Tournament, easily winning their 6 team Group before going down 2-0 to the hosts in the semi-final. (see the YOUTH TEAM LATEST page for fuller details. The Constitution duly ratified at the Molten Spartan South Midlands League AGM on 16th June sees Borough in a 19 Team Division One. An FA directive now enables Reserve Teams of Clubs playing at Step 3 or above to enter their Reserve teams at Step 6. The First game will be on August 11th.